When it comes to fashion if there is a person I idolize, then it has to be Kangana Ranaut. Her sense of style has evolved from small town girl to high end brands. She carries every look with elan and pride. The confidence with which she wears her clothes and styles them is something that we do not find everywhere. She is laid back, classy and sophisticated at the same time. Everything that she wears looks so good on her. Be it a simple jean or a high end couture gown. She rocks both the looks. Her choice of clothing is something that has awed me from years. She knows her clothes and her body. The clothes seem tailor made for her and she carries it off like she owns it. Having seen her in almost every possible style, it is very difficult for me to narrow down a few favorite looks of her. Now that summer is here, I have put away my denims and trousers. It is time to show some skin and look cool. Skirts and shorts are perfect for that. Skirts and shorts can be worn in so many styles and yet look feminine. Below are a few looks that I have absolutely loved with my style icon donning a skirt. Image Source: This & This. A pencil skirt has never looked this good before. The black pencil skirt is so well fit that it looks like it was stitched on her. It has the right length; ending just below the knees to add an illusion of height. The neutral grey shirt and shoes go perfectly with the black, without standing out. The chunky leather belt and the black bag are all the accessories she needs to look effortlessly chic and stylish. Just when we thought that pencil skirts cannot get better than this, came her plaid skirt. You cannot help but notice the school girl feel that comes with this skirt. It is absolutely gorgeous and the simple silk top complements it well and yet does not take away the focus from the skirt. The tan oxford shoes look brilliant and goes perfectly with the skirt. Pencil skirts look gorgeous and mean business at the same time. If you are a little waist heavy, you can still wear them with a longer top. Fab Alley has a wonderful collection of pencil skirts that are very affordable. Summer is incomplete without the mention of florals. A floral skirt makes one look younger and feminine at the same time. Wearing a skirt that ends at the thigh and a solid black top was top class. The socks and the booties are not to be missed either. The wild hair and nerdy glasses only add on to the entire look and reiterates the fact that she is one of the most stylish women of our country. Neutrals are usually considered boring. But not when Kangana is wearing them. The flared tan skirt adds a flirty feel to the look. A plain white shirt completes the look along with a matching bag and oxfords. The oxfords seem to be favorite these days and I have seen her wear them with many more outfits. Flared skirts can instantly pep up a look. Similar ones are available in Only. Maxi skirts are tricky to style, but not for this style diva. The powder blue maxi with a kurtaish top looks so elegant that no one but her could have carried off this look. Maxi skirts are perfect when you want to wear a skirt and yet not show too much skin. Showing off the mid-riff has been another staple this summer along with crop tops. But who would have thought of wearing the same fabric on a top and a skirt. Normally this look would have been a little OTT, but the natural makeup and neatly done hair makes her look stunning. Fusion skirts are a wonderful investment for summers. Especially for those who like traditional twists in their skirts. This royal blue skirt is so elegant that I want to go pick up one right now. The bird print and the hint of gold adds the necessary drama and I like the way she has kept the top simple and single toned. The black quilted bag makes an appearance again, but surprisngly it seems to go well with the outfit. Kaaryah has some wonderful fusion pieces. From blues to reds, they have every color on their palette. Skirts are now easily available everywhere. With Indians embracing fashion more and more, online sites have a large collection of brands for skirts alone. They can be pencil skirts or flared ones, the choices are aplenty. 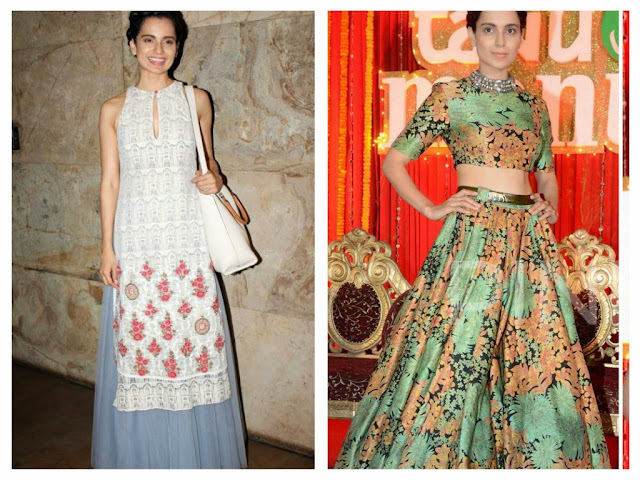 With fashion now being just a click away, I do not see why anyone cannot be the next Kangana. I loved the brown skirt. Kangana looks good in anything ! Um sure kangana is everyones style mentor!